Any idea if the pedestrians are taken care of?? If not, we need to immediately get their attention on this! Intially, there was a discussion between BDA, BBMP, NHAI and SWR (South Western Railway) as to who was responsible for the project. NHAI did make efforts, but now it appears SWR will be executing this project. I just hope SWR will not mess up this one like the other bridges in Whitefield, Marathalli where they have screwed up. Still, as this project is taken up, clearing the mess near KR Puram Railway Station is also paramount. BDA has initiated discussion on this matter. So lets hope for some solution in two years from now! Great to hear this. There was also an artist's impression in today's (24th) Deccan Herald - would appreciate it if someone could scan and upload it. @Srinidhi, where do pedestrians come into the picture here? There is a zebra crossing just 100m away at the Beniginahalli junction (turnoff to C.V. Raman Nagar). @mcadambi, what's wrong with the Marathahalli ROB? It's a beautiful six-laned marvel that's a treat to drive on (till you get struck at the next junction). The Railways are notorious for overstretching the schedule and poor design (their illustrious examples include the railway flyover near Puravankara apartments on Airport road, the underpass near Cantonment, the KR Puram bridge itself.. the list is very long). I hope the do it right this time. The project has been divided into two phases one stretching over 18 months and the 2nd phase (for which approval is still pending) over 24 months. 18+24 months is itself a very long time - i hope they wont stretch it any further. There was no mention of pedestrian passes in the report or in the pic, can we get the designs from somewhere (RTI will take a long time)? If pedestrian facilities are not included, changes should be forced before it is too late. The commencement of widening of this bridge has been long overdue, no doubt & all of us had been eagerly waiting. However, on going through the various photo contributions, views & comments made on another thread about this same "Tin Factory" area with various traffic flow patterns as also my local knowledge of this area, I am not so sure this will help much in resolving traffic conflicts in the area, other than to permit unrestricted, through passage for vehicles between east & west of the beniganahalli rail under-bridge & vice-versa over a short distance. Even with this "bottleneck" in place, the Tin Factory area is a mess & unsafe for pedestrians. After the underpass has been widened, the faster arrival of vehicles from the city side will result in longer pileups at Tin Factory & surroundings, as traffic will approach the area uninterrupted. Traffic bound for city from ORR /Hoskote will also be in a rush to get past the Tin factory area as the wider underpass would be very “inviting”. Thus, it would be like as if the “floodgates” had been opened & pedestrian access to bus-stops would become even more difficult with more continuous, possibly incessant flow of traffic. In my opinion, the CTTP had made the right recommendation pertaining to streamlining traffic in this area. It had suggested that the “kink” on ORR be removed & the road (ORR) be completely re-aligned from Kasturi Nagar to Mahadevapura along Selam railway line over a length of 5 kms. This would take away all ORR traffic out of the equation totally & confine the Tin Factory area to vehicles along OMR & Whitefield road only. This sounds like the correct approach to resolve the complex traffic flows than having to deal with traffic on ORR also routed past the area, conflicting with various other flows. 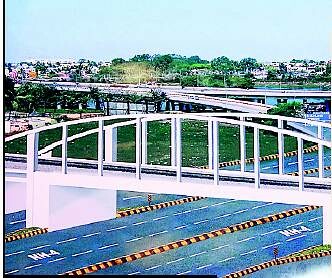 Up & down ramps from ORR could be provided for ascending or descending from the ORR on to OMR & vice-versa. Bus lanes & pedestrian facilities can also be organized far better with this approach. The authorities are well aware of these recommendations, but the press announcements do not seem to include this important element, which must be integrated with the widening of the bridge right from the start to avoid more serious, possibly un-resolvable complications later. does the plan have design issues? As I can recollect the lanes leading to the bridge on either side of the bridge is just 4 lanes to the maximum..
why are we creating a 6 lane main bridge and 4 side lanes..a total of 10 lanes!? do we need it that big? Also as Naveen rightly says, the current jam at the bridge was acting as a signal which was contolling traffic at the next junction at the begining of the cable stayed bridge..all hell will break loose if we just have a 6 lane bridge at benniganahalli only..
All trafic will get clogged few 100 meters from this bridge..unless we plan something urgent for that junction too! About pedestrians..just before the bridge and after the RMZ building..there is a bus stop which is used regularly by many people..and pedestrains will need ways to cross over when the bridges are completed..its no good to have zebra crossings for them as it defeats the purpose to have a bridge in the first place..a magic ped underpass should be ideal! I agree with Naveen. The ORR has to be taken away from that area, otherwise the traffic will always be a mess,besides slowing down the ORR traffic.Also with the Metro, the proposed Railway station and Bus Terminal,simply broadening the underpass is not enough. Some proper scientific planning is called for. Also does anyone know what will happen to the traffic in the 18 month/24 month period?As it is Old Madras Road is a mess and a nightmare. I finally managed to get a copy of the pic from Deccan Herald. Similar to what Srinidhi uploaded, but shows the entire bridge. My suggestion of a comprehensive plan on the western side of the bridge would be to make both the Benniginahalli Main Road and the Nagavarapalya Road (from Big Bazar) one-ways up to Nagvarapalya Market (in opposite directions). Then construct a magic-box affair at Beniginahalli, permitting movement from OMR towards C.V. Raman Nagar. Since the road is prohhibited for HTV, only cars and two-wheelers are likely to use it and they should find no problem. A pedestrian footpath can be constructed inside the magic box or in a parallel one alongside. The entire stretch of OMR from the underbridge till NGEF junction must be barricaded with a high median. A U-turn can be provided at NGEF and in future, this can also act as a exit for the metro station. Most importantly, a skywalk must be provided immediately at Tin Factory and the speed-breakers there should go. This, I feel, will ensure a reasonably free flow of traffic from NGEF till K.R. Puram Station/ I.T.I. Gate. Bangalore going la Paris way for Bikes!